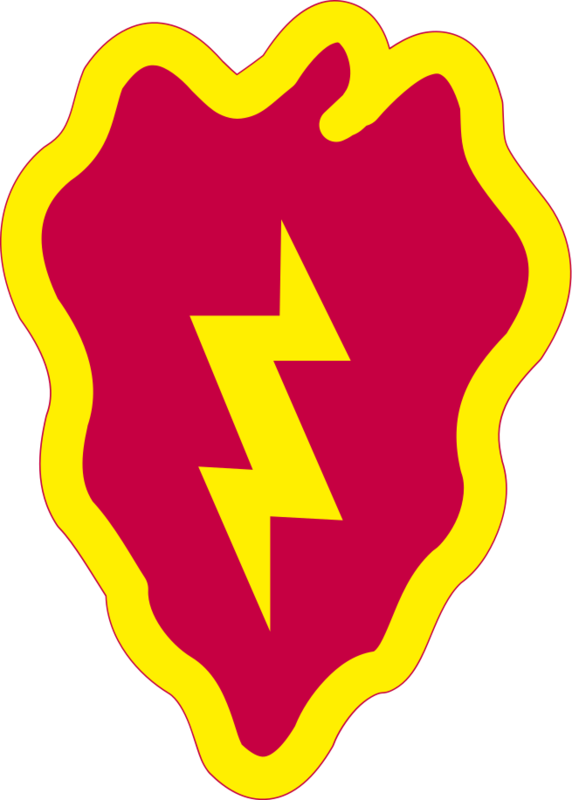 Activated in Hawaii back in 1941, the 25th infantry Division is known as Tropic Lightning. Their primary operations are within the Pacific and Asia region. In today’s post, I am going to tell you about the various campaigns the 25th Infantry Division has been a part of and I will also tell you the decorations this division has attained. During World War II, the 25th Infantry Division participated in several campaigns. The first mission was defense of Honolulu and Ewa Point. From there, the 25th Infantry Division traveled to Guadalcanal in late 1942. They took Kokumbona from the Japanese and fought in rugged conditions. By February of 1943 they had gained full control. In mid 1943, the 25th moved on to the Solomon Islands and New Georgia. They captured Vella Lavella. By the end of September, they had control of New Georgia and had also cleared Arundel Island. The 25th then went to New Caledonia for added training for upcoming missions. The training made this division live up to their name. The 25th was like lightning as they landed in the area of Luzon, Philippines. The 25th battled the Japanese through the plains and rice paddies. They then went into the mountains and battled fiercely. They captured many important points and afterwards, they spent occupation duty in Japan for 5 years. Tropic Lightning was a major “player” in Korea. They were one of the first divisions transferred to Korea when the North crossed the 38th Parallel. Their first mission which was successful was blocking any entrances to Pusan. In October of 1950, the 25th broke out of Pusan and drove into North Korea. But Chinese forces pushed back. It was give and take until settling south of Osan. In January of 1951, the 25th launched a new mission and by February, they had captured Kimpo Air Base and Inchon. Last but not least, Tropic Lightning defended Seoul from a heavy Chinese attack and the 25th was one of the most decorated divisions during the Korean War. It is difficult to remember as there were many Tropic Lightning soldiers who died in the jungles of Vietnam. Through all of this, there were many Medals of Honor. 1st Lieutenant John Warren Jr.
Staff Sergeant Hammett Bowen Jr. Very few participated in Operation Desert Storm as they were in defense positions in Korea. 4 platoons deployed for the Gulf War. Some units deployed to Afghanistan in 2004 for combat operations. Members of the 25th were tasked with hunting down Al Qaeda and Taliban members in the mountains of Afghanistan. Units deployed for Operation Iraqi Freedom. The 3rd Brigade Team from the 25th took control of one of the most dangerous areas of Afghanistan. And just recently, it has been determined that approximately 1,500 soldiers from the 25th were headed to Afghanistan. 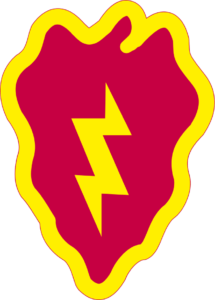 Known for moving swift and sure just like a bolt of lightning, the 25th Infantry Division deserves their nickname Tropic Lightning. We would love to hear from current or former Tropic Lightning soldiers… Please tell us a story of your time in the division. You can leave your comments and questions below and please share this on social media. Thanks.. Previous Previous post: Somalia, We Are Back!